HomeDog BreedsBelgian Malinois vs German Shepherd – Which Is The Best Family Dog? 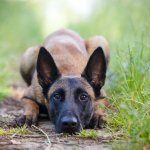 Belgian Malinois vs German Shepherd – Which Is The Best Family Dog? 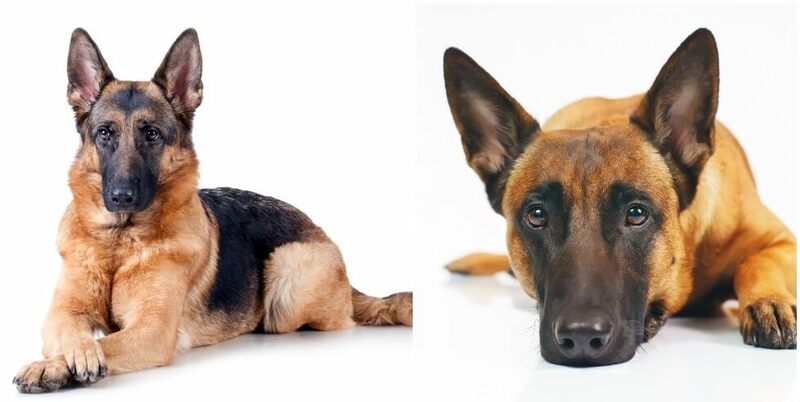 Belgian Malinois vs German Shepherd – can you tell the difference? The GSD is left and the Malinois right. Belgian Malinois vs German Shepherd – which dog is the best for you and your family? 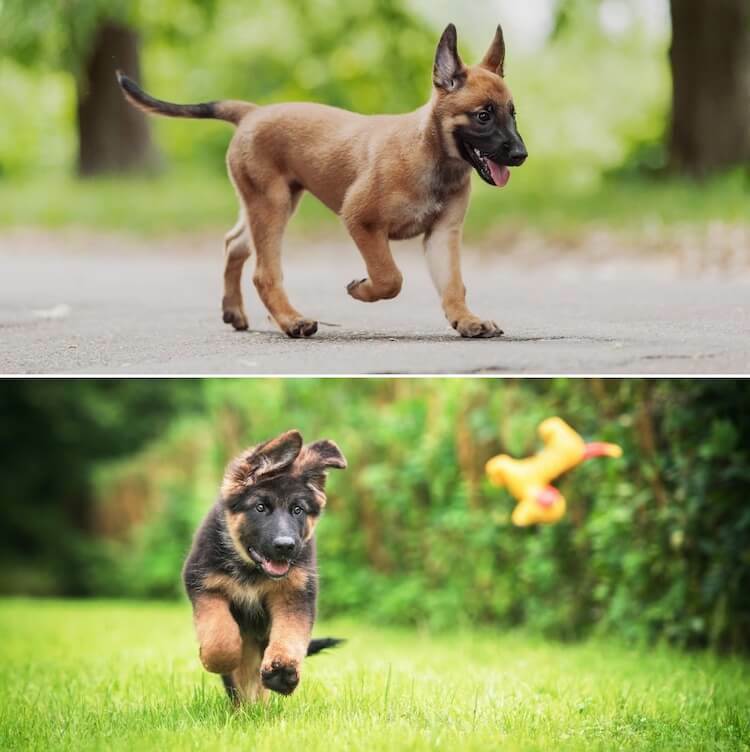 Often confused by those who don’t know what to look out for; the German Shepherd and the Belgian Malinios, whilst both working dogs, are incredibly different breeds. Standing similarly in height, weight and often color, the German Shepherd Dog can make a superb family pet with experienced handlers whereas the Belgian Malinois suits active owners with a busy lifestyle. Both intelligent and devoted companions, here we will compare and contrast the Belgian Malinois vs German Shepherd. Belgian Malinois vs German Shepherd: What’s The Difference? The German Shepherd Dog not surprisingly originated in Germany in the 1800’s and as the name suggests, it was a prized sheep herder. Through their activities on the sheep field, the GSD developed its agility, speed and stealth all of which are now loved for its working capacity. 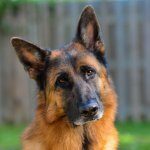 The GSD found its way to the states in the early 1900’s and was re-named “The Alsatian” during the World War to avoid the German link, but we’ve since returned to the title known and loved! Recognized by the American Kennel Club, the German Shepherd is incredibly popular, ranking number 2 out of 192 breeds. For one of these adorable GSD puppies you can expect to pay anywhere between $300-$900, but, show dogs have been known to boast a premium price tag of between $6,000-$9,000. Due to the range of health issues prevalent in the breed, it is essential to research a reputable breeder and check the health of the parent dogs. Just across the border is where the Belgian Malinois (pronounced Malin-wah) was born. Another European Herder, the Mal possesses a sterling working temperament. The Malinois found its way to the states around the same time as the GSD did in 1911; they thrived and flourished until World War II placed a ban on importing European breeding stock. Military and police roles; being employed at the White House. Prized anti-poaching work in South Africa where one Malinois has received the PDSA Gold Medal for his efforts preventing Rhino poachers in Kruger National Park. Belgian Malinois are more expensive than GSD’s, these guys carry a premium price tag of $1,500 – $2,500 USD. Whilst some may say you should give more consideration to a breed before shelling out such a high premium, the reality is, any dog requires careful consideration. Both the German Shepherd and the Belgian Malinois are large, powerful breeds. They are both intelligent and active, requiring experienced handlers. Whilst our table of temperament may indicate these two breeds are the same, they are not. However, both dogs have similarities, as they are herding and working breeds, the Belgian Malinois and German Shepherd are highly intelligent. This intelligence means they are super trainable (this doesn’t mean they are suitable for first time owners). 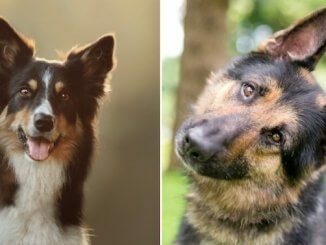 German Shepherd dogs come in third for intelligence behind the Poodle and the Border Collie; they won’t suffer a bad owner. 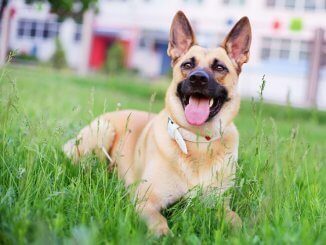 Both German Shepherds and Malinois dogs are large and powerful breeds – they require an owner who understands their needs. The Belgian Malinois, well he is already 10 steps ahead of you. They carry this eagerness to have a purpose which is why they need an active home. 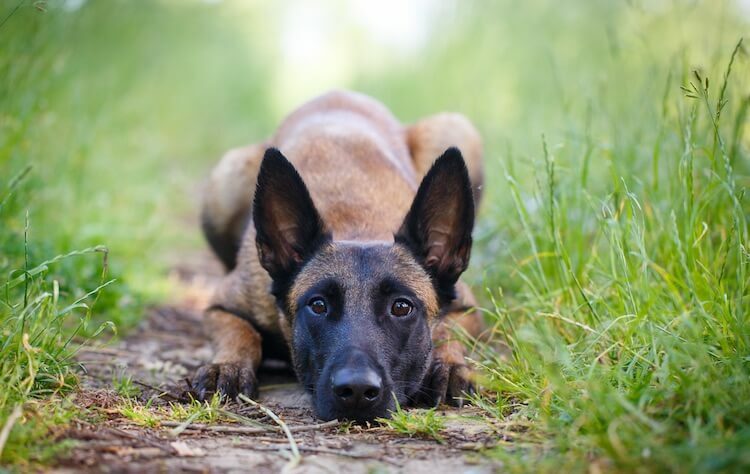 Whereas a German Shepherd will be happy with daily walks and mental stimulation, the Malinois needs daily walks, runs, hikes and twice the time on mental stimulation. It’s said that Belgian Malinois dogs have a puppy like energy until they’re around three years old – that’s if they ever grow up. They just want to be doing something; a bored Malinois is destructive. Both being historic protectors, they are naturally wary of strangers and often aloof. But those in their family? They will be forever devoted to you. Whilst the German Shepherd doesn’t cope being left alone, they are able to entertain themselves if you’ve returned from your daily walk and need to catch up with some errands. The Belgian Malinois on the other hand does not cope with being away from his human. German Shepherds, when in the hands of experienced owners make superb family pets as they are loyal and devoted. With children who understand the needs of large breeds, the German Shepherd will be their faithful companion. They will play ball in the garden and be the shoulder for your kids to cry on. You truly would never meet a more loyal breed. The Belgian Malinois isn’t suited so much to family life. They can become neurotic and destructive if not stimulated enough. 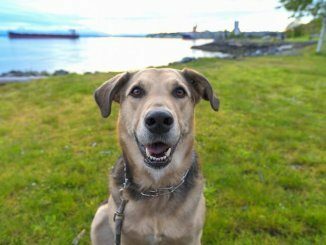 These guys thrive in adult only homes, with energetic owners who love being outside. Hiking, walking, running, you name it, they’ll be there. 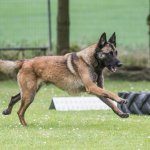 If you have an active lifestyle, the Belgian Malinois will be the most loving, affectionate and devoted comrade. Whilst there are some similarities when comparing a Belgian Malinois vs German Shepherd, it’s clear that the GSD is a dependable addition to a family home with experienced handlers. The Malinois on the other hand is more suited to adult only homes who have an active lifestyle. Belgian Malinois vs German Shepherd: Does a GSD Eat More? Both being large breeds, you would expect to feed both dogs around 20 calories per pound of body weight per day. You should expect to feed your Belgian Malinois around 1,200 calories per day and your German Shepherd 1,600 calories. Again, as they are both large breeds, they are both at risk of developing bloat, or gastric torsion. This is where the stomach twists and fills with gas or air and is often fatal (read more about this in the health section below). For that reason, it is advised to feed both dogs multiple times. Ideally through puppyhood you should be feeding four meals per day. When matured, this can reduce to two meals per day. You should also avoid excessive gulping of water. This is more of a concern on returning from exercise or during exercise. Belgian Malinois vs German Shepherd: Are Malinois More Agile? 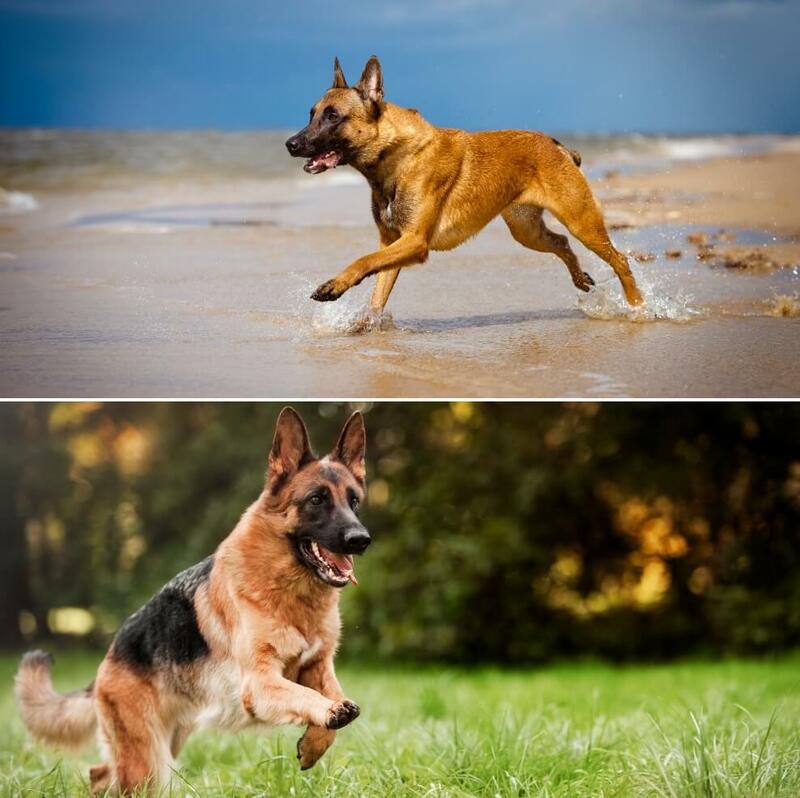 Both the German Shepherd and the Belgian Malinois come in high on exercise requirements. The Malinois more so because of their need for activity. The German Shepherd will be happy with upwards of 60 minutes of exercise per day. A healthy German Shepherd will hike through hills or in the woods. He will follow his owner anywhere. 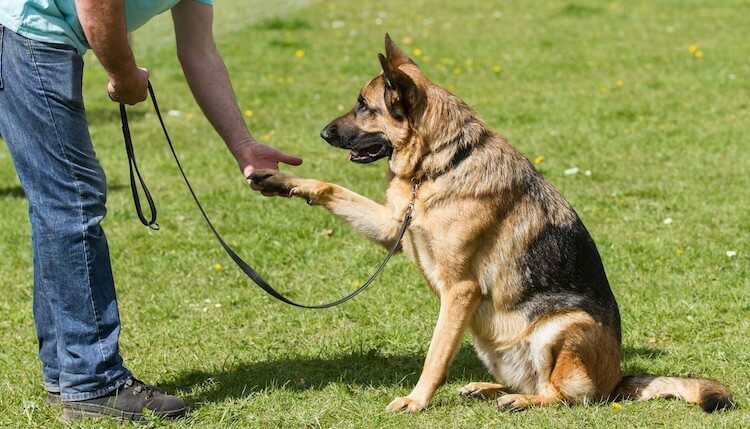 Despite their trainability, it is advised to keep German Shepherds on a leash when out walking, due to their size, other people can get intimated. The Belgian Malinois on the other hand will never stop, he will hike for hours, he just loves to be busy! Again, it’s best to keep this guy on the leash, due to his size and the fact he may just find something a little more interesting than you. Remember their juvenile energy. Not only that, but mental stimulation keeps them occupied too. Both the GSD and Mal’s intelligence mean they excel in obedience classes and agility, so these could be an option to tackle those energy level. Both being super intelligent dogs, they are incredibly trainable dogs; in the right hands. Just because a dog is trainable, doesn’t mean they suit first time owners. These guys need experienced owners, who understand how to train them and what they will respond to. They respond to positive reinforcement and reward-based training. Despite them being large breeds, avoid aversive techniques at all costs. It is well established that punishment creates and exacerbates problematic behaviors. Dog’s learn through the consequences of their behavior. If they experience a positive consequence, they are more likely to repeat the behavior. If they aren’t behaving how you would like them to, ignore and re-direct or encourage a behavior that you would like to see, then reward/praise. Start whilst he is in the same room as you and have someone hold his collar or obey the “stay” command. Hide treats or toys around the room, behind a cushion, behind a curtain (safe locations, easily accessed). Command the word “seek” and have your helper let him free. Encourage him to seek the toys/treats. Play in different rooms or play in the yard. The key to raising a well-rounded and stable dog, whether it be a GSD or Malinois is early and continued socialization. Introduce them from a young age to those things they will regularly come across. Historic workers and protectors, they are naturally wary of strangers, they need to learn what is safe. Well-socialized GSDs and Malinois are stoic and fearless. Both being large breeds, we know that the GSD and Mal both suffer from Hip and Elbow Dysplasia. This is where there is abnormal development in the elbow and hip joint causing lameness, pain and stiffness. German Shepherds are prone to degenerative spinal stenosis. They are also prone to degenerative myelopathy which also affects the nerves in the hind area leading to loss of mobility. Belgian Malinois on the other hand have totally separate health issues including cataracts, epilepsy and progressive retinal atrophy which is an inherited condition causing vision loss and eventually blindness. Finally pannus is prevalent in both breeds which also affects their eyes and vision. This is where many get confused between which is the German Shepherd and which is the Belgian Malinois. Both similar in size and often in color, we’ll let you know how to tell the difference. The German Shepherd most commonly comes in black and tan, but you will see them in solid white or black colors too. They may also be black and silver or sable and liver. On the other hand, the Malinois, range from rich fawn coloring to mahogany. The Malinois bears a resemblance to the GSD but has a smaller head, is leggier and finer boned. You may notice the Malinois often has a black mask on his face. German Shepherds can have a long or short coat, but both are double coats. The Malinois only have short coats, but again this is double. What this means is there is a downy undercoat, with coarse guard hairs to protect from the weather. Both breeds require regular grooming, 2-3 brushes a week will keep their coats in good condition. They will both shed, a lot. You will need to regularly check their ears and eyes and brush their teeth a few times a week. Keep an eye on their nails to ensure they aren’t getting too long. Although their regular exercise should be ample to keep them short. The Belgian Malinois will grow to the same size as a German Shepherd of around 24-26″ in height, however the GSD will weigh more at around 90 pounds compared to the 60 pounds of a Malinois. Size Both dogs can grow up to 26” in height, however, a Shepherd will weigh more than the Malinois weighing up to 90 pounds and 60 pounds respectively. Price A GSD puppy ranges from $300 – $900 USD whereas a Belgian puppy will cost between $1,500 – $2,500. When comparing a Belgian Malinois vs German Shepherd both have similar grooming and feeding requirements, their comparable qualities realistically end there. 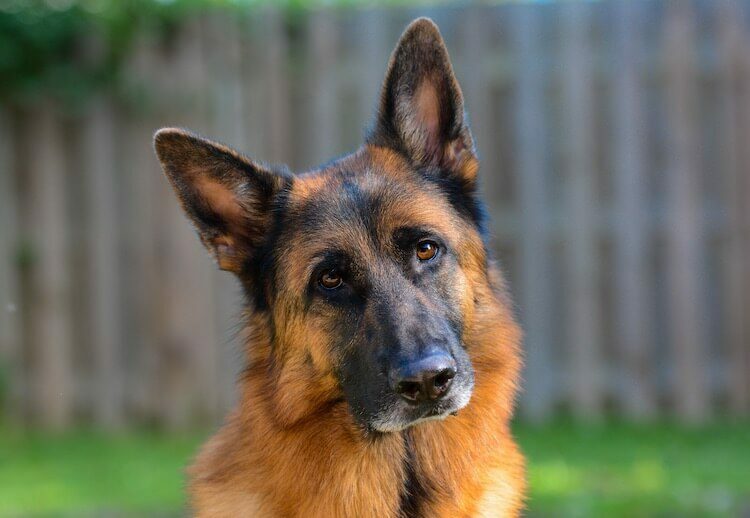 German Shepherds are intelligent, alert, loving and devoted. He will suit experienced large breed owners who understand his needs. When socialized from a young age, he will thrive in a family home and be a faithful friend. 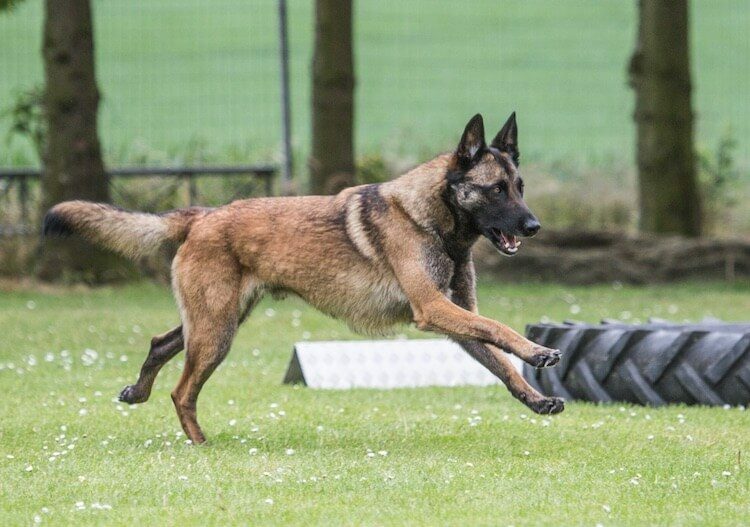 However, the Belgian Malinois is more suited to adult only homes with an active lifestyle. His intelligence and energy means he just loves to be busy. Not particularly tolerant of being alone, he can become destructive and neurotic. Whilst similar in appearance, their character and temperament differ in many ways. Both impressive breeds; they both need very different things from their owners. Let us know your experiences with a comment.